By upping the dpi game to 3200 (up from the previous front runner, the Raptor-Gaming M2 at 2400dpi), Saitek's giving gamers what they want—more resolution for twitchfests like Unreal Tournament. 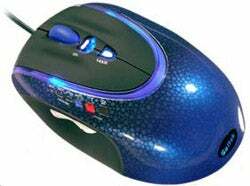 The mouse itself is lefty-friendly, has five different LED backlight colors, rubber-like coating, dpi mode switch (800, 1600, 2400 and 3200), is weight adjustable, macro programmable and feels fairly decent in the hand. However, although it is 3200dpi, the polling rate was only 550Hz, or a 1.7ms response time. Other mice like the Microsoft Habu and Razer Copperhead had a polling rate of 1ms. All in all, it's not a bad mouse if you're into gaming, but you'd have to turn down the dpi whenever you work on the desktop unless you like cursors flying uncontrollably.